The construction and renovation of the Kainuu Central Hospital will secure local on-call medical services and deepen the integration of basic and specialized healthcare by operating in a shared building. This significant wood construction project is carried out by the ‘Kainua’ Alliance according to Smart Hospital objectives that aim at increased efficiency and fluency both in the operations and care, and in property utilization and maintenance. BIM-based design has been the principle and the client’s requirement right from the start. The main parts of the current hospital were completed in 1969; they have now passed the last dates of their service life regarding both technical solutions and functionality. The new hospital consists of three parts: the new main building (F), the new logistics terminal (G) and the renovation of the current emergency building (E) to serve other hospital operations. The renovation takes 5% of the gross area. Project development started in March 2015 and the implementation phase in February 2017. The hospital will be completed in two phases and finished in the autumn of 2021. This is a demanding project, both technically and operationally. The building and its technical solutions must first and foremost support effective medical care. For the client, it is important to ensure flexible use of facilities and thereby support the requirements of the changing hospital operations, which is why the building services play a major role in the project. Regarding HVAC implementation, the management of the essential systems (including operating conditions, monitoring, security and communications) have been centralized in an integrated user interface. Energy-efficient lighting, heating and cooling solutions, logistics automation, reserve power supply and ICT solutions are all important reforms that will serve the whole property. The new Kainuu hospital is also an impressive public timber construction project, which has affected its design from the start. Production and economy-wise, the most effective solution was found in prefabricated wood panels. More than 10,000 m2 of wood-framed facade elements will be attached to the concrete frame of the building. The elements are delivered ready for installation with windows and flashing included. In practice, the facade of the main hospital building will be completely made of wood. The gross area of the seven-storey building is 46,282 m2. It is made up of 7350 precast concrete units and circa 11,270 m3 of cast-in-place concrete. The weight of the steel structures is 290,700 kg. A challenge for construction is that the emergency services must not be interrupted during the project. The safety of the patients and the personnel is the number-one priority on site. By phasing, the transfer of operations can be implemented without temporarily moving the patient care. Collaboration among the project parties has been exceptionally tight using a Big Room on site, remote connections, data reserves and BIM coordination. User-centred design that involves participation of the hospital staff in various work committees has brought up opportunities, requirements and limitations to be handled together with the alliance parties. The alliance has implemented the entire design based on the client’s operation plan from a premise scheme, master plan and conceptual design to an approved general plan and the building decision. Modeling is not a separate task but an organic part of the project implementation. In addition to structural, architectural and mechanical design, modeling of the hospital equipment has added value in the project. In addition to project coordination, the key BIM benefits have accrued from comparing alternative designs and implementing changes in the conceptual design phase and in cost estimation, procurement and building production tasks. A major challenge in the development phase was to reliably estimate the cost for the building decision and to match the target price of the alliance. 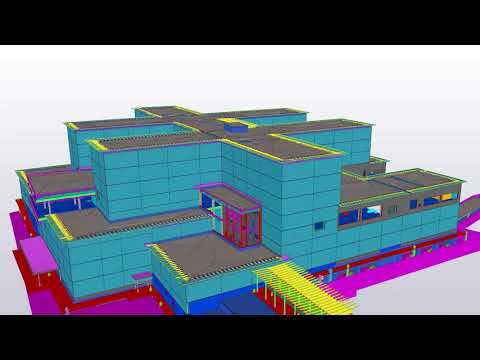 Building information models were utilized extensively using Tekla Model Sharing during real-time quantity calculations that served the project’s cost management. The quantities were obtained from the model using the Organizer tool. Accurate quantities were a significant benefit in the calculation phase, as the same information could not have been realistically produced by any other method. The tight schedule was met thanks to good cooperation among the design and the calculation teams. Although structural drawings had not been published for all floors, obtaining the bills of quantities for different production phases was possible by using the model. In addition to the structural model, the cost calculations utilized the ArchiCAD model in the native and IFC formats. With the building frame, the objective has been to use as many precast elements as possible and minimize the amount of CIP concrete. Keeping up with the production schedules required ten designers to simultaneously work on the structural model, which called for discipline and preparations to avoid software conflicts and delays. The main software used in the frame design was Tekla Structures. In addition, AutoCAD was utilized in documentation to produce detailed structural cross sections. All precast concrete data was transferred from the Tekla model directly to the manufacturer’s ERP system. It would have been extremely difficult to manage all the special materials for the hospital without the data available in the model. With the help of the model it has been possible to plan the production for both procurement and material calculations before obtaining official production drawings. Vertex BD software was used in designing the wood panels; geometry source data and hole reservations were imported from the Tekla model. Data exchange between the programs was performed in IFC format. In addition, Trimble SketchUp was in use to model certain construction elements and temporary references. Hole reservations were managed completely based on the model. The main participatory tool was the Sweco CAVE (Computer Assisted Virtual Environment) that allows moving around close to 1:1 scale in 3D virtual reality. More than 800 members of the hospital staff have participated in the CAVE sessions so far. The models are also used in the hospital units’ information sessions and later to help induce the building into use. On site, BIM is applied to plan and monitor the production as well as to actively manage the various construction tasks. For the project engineers, the model is an important tool to create an overall schedule and weekly plans, and to manage the production meetings. Mobile devices and on-site BIM Kiosks are used to aid construction. The QR codes embedded in the drawings make construction as well as site management more efficient because they can be used to quickly open the respective model on the screen of a mobile device.